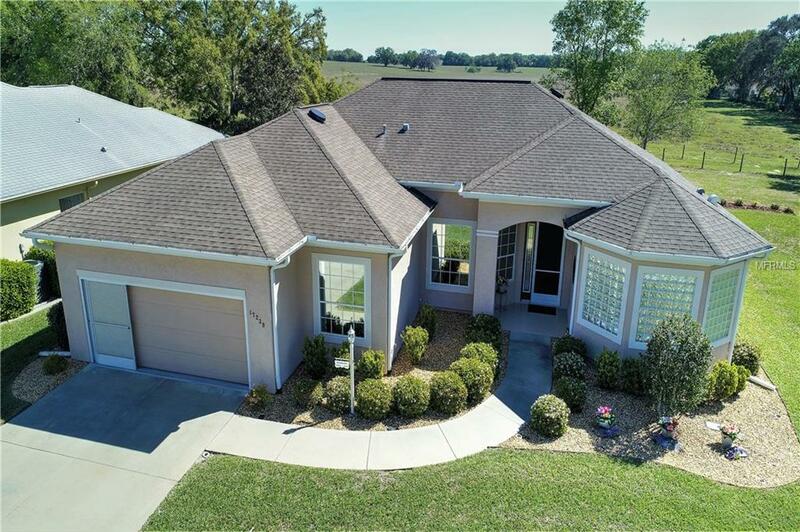 Popular San Marco Model with Professional Landscaping. Features a FABULOUS PRIVACY VIEW backyard with fountain, patio, retractable awning and panoramic views. Immaculate and spacious floor plan features formal dining room, living room and family room. Kitchen has large island, 42" cabinets while indoor laundry has cabinets and closet. Overhead fans in every room. Split floor plan offers 3 large bedrooms and master suite has 2 walk-in closets, tiled shower and soaking tub. Enclosed Lanai offers extra living or entertainment space. Over sized 2 car garage offers separate golf car parking area. Insulated garage door and pull down stairs to large lighted storage area. Upgrades include new furnace/ac with humidistat (2014), 2 solar fans (2015), kitchen solar tube (2015) and 3-M Prestige Window Film on all windows (2015). Also conveying are a 28 CF FRDR Refrigerator Food Showcase (2015), Samsung Washer (2015) and Samsung Dryer (2015).